Founded in 1912, Hill Behan Lumber Company was a prominent retailer of lumber and building materials with locations in four states: Missouri, Illinois, Mississippi and Louisiana… Hill Behan Lumber Company first began operations in Brookhaven, Mississippi in 1943 as Columbus Lumber Company, a Southern Yellow Pine sawmill and lumber treatment plant. 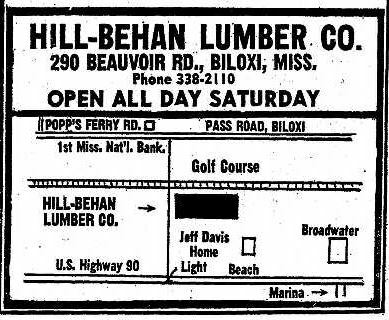 Hill Behan Lumber Company later added a retail building material outlet serving Southwest Mississippi home builders and homeowners. In 1970 Hill-Behan decided to expand into the Biloxi-Gulfport market with the construction of a store on Beauvoir Road. Hill-Behan Lumber Company will open a new business in Biloxi in September, offering a new concept in building material merchandising. The building is now under construction on a 10-acre site fronting Beauvoir road between the L&N Railroad and the Jefferson Davis Shrine. Dennis Behan, vice president and general manager, pointed out that 11,200 square feet of the 19,600 square foot building will be air-conditioned. The air-conditioned area will include a show room area. Hardware items, paint, and wood products sold by Hill-Behan will all be under the same roof, Behan stated. Behan said the structure will be a wood building with cedar shake roof in the front, built with attractiveness in mind. This will be the 25th such business of Hill-Behan in operation in the St. Louis, Chicago and New Orleans market areas, according to Behan. He also noted the company owns and operates its own sawmill in Brookhaven, Miss. The store would also sell tools. Stylistically, the building seems to follow a corporate design for all Hill-Behan stores of the period. This store opened just shy of a year after Hurricane Camille hit in August, 1969, so there was certainly a market demand for the firm’s stock in trade. In 1970 the competitor chain Builder Square, then known as Home Centers of America was founded, and 1971 was when Handy Andy Home Improvement Centers opened their first expansion store. It certainly seems to be a time period when this new type of retail was flourishing. I believe Hill-Behan would also open stores in Jackson and Brookhaven. Does anyone recall other Hill-Behan stores in other parts of Mississippi? When the Hill-Behan Company closed in 2001, the chain had been reduced from thirty-some stores down to eleven stores. I don’t recall that the Biloxi store was one of those, having closed earlier. For as long as I care to remember this structure has been for sale or lease. For being a decorated shed, the building still is impressively intact, retaining its mansardic facade, cedar shingles, and signage. As this building is only a few years away from reaching the “magical” fifty-year mark for being eligible for inclusion on the National Register of Historic Places, what do you think its chances of survival are? Do you remember your first experience encountering a store of this type? Brookhaven did have a store which was located on the grounds of the Brookhaven mill. That building still exits but now serves as a warehouse for the mill – still named Columbus Lumber Company but no longer owned by the Behan family. Dennis Behan who was quoted in the Daily Herald story lives in Brookhaven. Interesting. Thank you for sharing the Brookhaven store location. Is that the site of what is now Rex Lumber or is Columbus Lumber Company a different location? An excellent rundown not only on the lumber concern but also on how this style of prosaic architecture has become the predominant feature of the American landscape (sadly). Well done! Thank you. I’m glad you found it as interesting as I have. What a great place. Do they sell both lumber and hardware at Halls? Interesting read. I’d not stopped to think about Hill-Behan being the predecessor of the big box home improvement stores, but that makes perfect sense. When they opened in Jackson on Presto Lane I was a teenager. Often went on Saturdays with my dad and thought it was an awsome place because they had, in my mind, combined a lumber yard with a hardware store. Shopped there myself until they closed vs. going to Home Depot or Sutherlands, before Lowe’s reinvented itself. The building became a Salvation Army thrift store until it unfortunately was destroyed by fire in the winter of 2014. I’m guessing January just because I remember it being a very cold day. Apparently the parent company is still around and has a few lumber yards in Missouri and maybe Illinois. Just went back to their roots rather than broader home improvement. Thank you for the compliment and thank you for identifying the Jackson Hill Behan location. Wow it is nearly the identical building. It does seem to be a combination hardware and lumber yard that catered to a property owner as well as building professionals. Interesting that the locations for both stores appear to be by rail lines. i was curious if the Biloxi Store ever had a rail spur, but the historic topo maps I looked at did not indicate that their was a spur. Do you recall a rail spur at the Jackson location? No rail spur at the Jackson store. There was one across the street at the Presto plant, but I don’t guess that would matter. Ah! I never realized the old Salvation Army building had that history–thanks for cluing us in! I also often went with my father to the Hill-Behan location on Presto Lane when I was a child. It was very convenient, since we lived nearby. I had never thought before of it as the predecessor to Home Depot, but it really was. Thanks for the memories brought forth by your article. I think this site in Tupelo on Nelle St. is where Lowe’s used to be. I do not know if it was a Hill-Behan business before Lowe’s. Does it look like a Hill-Behan building? Oh wow, how bizarre! The 2008 Google Street View shows the structure with Lowe’s signage. Maybe it was a Hill-Behan? Do you have access to old city directories or phone books at the Tupelo Library? That could confirm the suspicion. It definitely looks like it was built specifically as a home improvement / lumber yard facility. I do have some city directories. Have a 1972 one and some from mid-1960s. I don’t live in Tupelo now but I do know that the Lee County Library (Tupelo library) has several city directories. Some are REAL old like from the 1950s. HA! I have put in a question to a Facebook friend from Tupelo who used to work at Lowe’s. Checked my city directories. The 1971-72 is the newest one I have and it does not have a listing for Lowe’s or Hill-Behan. Thanks! Please let us know if you hear anything back. In Hattiesburg is a building that struck me as similar to the Tupelo building you shared. hmm. In a 1972 aerial photo the front part of the structure was under construction and towards the rear of the property was a since removed rail line. A definite possibility for a Hill-Behan store. Thank you for sharing the background of your family business, especially the insight behind the decisions as to where the stores in the Southern Division would be placed. Hello Mr. Behan, I am in search of my father who worked for Hill Behan, probably in the late 50s to maybe the 90s! Is there any way that you can help me in that area? We lived in Houma, LA, but he would travel there to work. He either lived in East Feliciana Parish, St. Mary Parish or Orleans Parish. In regards to the inquiry about rail spurs, all of the stores had rail spurs at one time. With the exception of maybe Franklin and Reserve. (Built in the 80’s) We used to buy lumber by the car load in the 50’s 60’s and 70’s and have it delivered to the individual stores. In the 80’s we began to stop that practice and some of spurs were removed by the railroad. However, we would still get car loads of spruce studs from Canada delivered to the Harahan, LA location (HQ) and would ship them to the yards on a tractor trailer in bunks with other dimensional lumber mixed in. If you look the map you will notice that most every Hill Behan store was built next to a railroad. In later years when the big boxes were building in more desirable,heavily trafficked parts of town the railroad sites were less desirable. Thank you for confirming the theory about the rail spurs! My dad, uncle and grandfather worked for Hill-Behan in Chicago. All had great stories of cruising timber for the company up in Canada. They would look at trees the morning and then fish the rest of the day. My understanding was that all of the Chicago locations were on a rail spur. My uncle worked for Hill-Behan his entire life. Columbus Lumber Co used to be a customer of mine back in the 90’s. I did not know that they were part of Hill-Behan at the time. Mr. Behan’s list didn’t include Canton, but Phillip’s Lumber in Canton reminded me of the Hill-Behan design. It’s also on the railroad, and it’s still open!